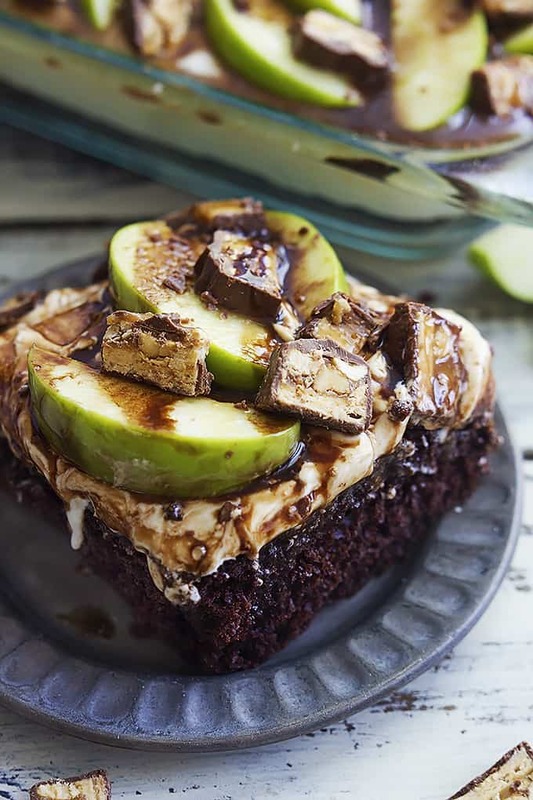 Chocolate cake topped with whipped cream, green apples, and chopped Snickers bars – all drizzled with caramel and chocolate sauce to create this Caramel Apple Snickers Cake! I admit, these pictures are not my finest work. But I guess I’m suffering from a bit of almost-graduated-fever-laziness because I made this cake, it was crazy delicious, I snapped a couple of pictures, and I’m too excited to share it with you and can’t wait til the next time I whip it up to re-photograph it. So sub-par photography will have to do today. Just focus on the food, it’s more than enough to keep you distracted. Shall we talk details? A layer of chocolate cake gets smothered in cold and creamy whipped topping. Already drooling? Well hold on because there’s more. The caramel apple and Snickers part of course. 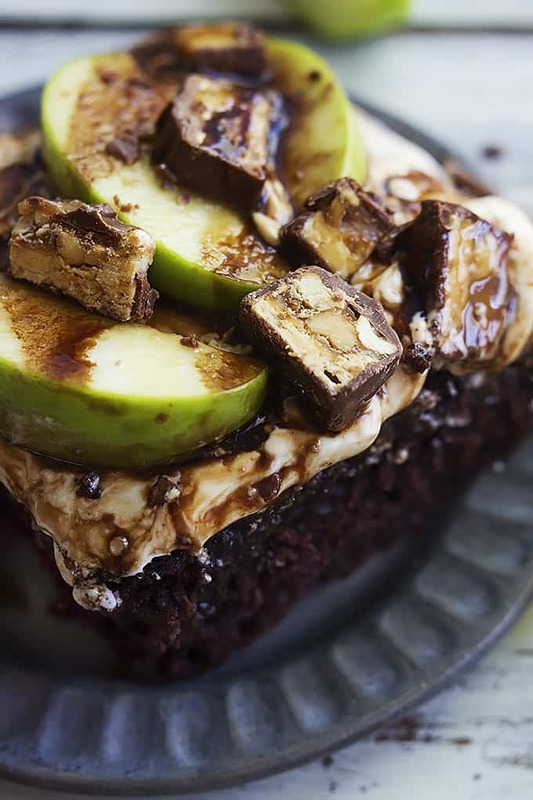 Thinly sliced tart green apples and chopped Snickers drizzled with chocolate and caramel sauce. Honest to goodness it tastes like a caramel apple. On top of whipped cream. On top of cake. 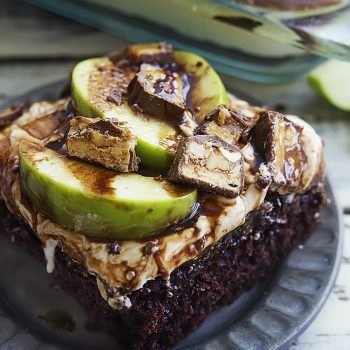 Chocolate cake topped with whipped cream, green apples, and chopped Snickers bars - all drizzled with caramel and chocolate sauce! Prepare cake according to package's instructions. Discard 1/2 cup of the batter. Bake in a greased 9x13 inch pan at 350 degrees for 35-40 minutes or until an inserted toothpick comes out clean. Allow to cool. Mix together cream cheese, cool whip topping, and powdered sugar til smooth. Spread on top of cooled cake. Chill for at least 1 hour. Top whipped cream layer with sliced apples and chopped Snickers bars. Drizzle with caramel and chocolate sauce. Serve immediately. *If desired, this dessert can be made ahead of time. 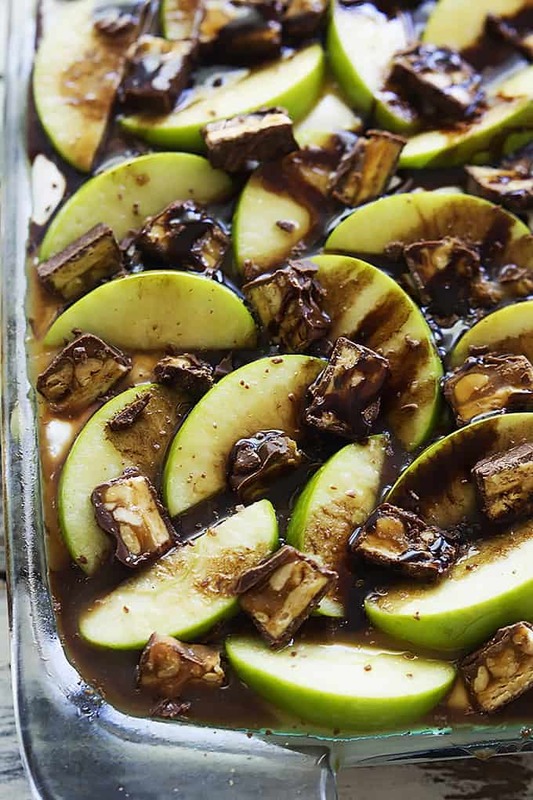 After adding all of the toppings, wrap the pan tightly in plastic wrap to make sure there are no holes where air can get in and out which will brown the apples. Chill until ready to serve. More Cake Recipes you'll love! How decadent! These cake looks pretty amazing. These photos are doing a great job of making me drool, Tiffany! I love the addition of tart apples to balance the sweetness of the cake. Seriously! So, so much YUM! Could you make these as cupcakes for easy grab and go? Would you still discard the 1/2 cup of batter? Nope, don’t worry about discarding any batter, just be sure to not fill the cups too high or you won’t have room for the other layers!